Jenna Coleman is back on the throne as Series 2 of Victoria finally returns to our screens. The show is certainly bigger than it’s ever been – but is it also better? Let’s put it this way. The episode kicks off with those now-iconic titles and music. Instantly, that warm fuzzy feeling of familiarity sinks in. After a brief detour to a snowy Khyber Pass (more on that later), we get a whistle-stop tour of Buckingham Palace to bring us up to speed. We see Victoria with her newborn daughter, sat in the most hilarious-looking wheelchair contraption. With canine companion Dash on her lap, she is carried through the palace. “This is ridiculous!” Victoria exclaims, before proceeding to just get up and walk. Within the very first minute, Series 2 reminds us exactly why we love this show to begin with. Such charm, such wit – and boy oh boy, does it ever look good. Right away, and indeed throughout the episode, it’s clear that the aesthetics are just as pleasing as they ever were. The sets are lavishly decorated and oozing with regal beauty. The costumes are absolutely divine, not a single outfit failing to impress or looking out of place. Everything looks so perfect and feels so right. No doubt a lot more budget has been put towards the show following Series 1’s resounding success – and it’s definitely gone to good use. You’ll be hard pressed to find a more visually pleasing series on British television than this one. In fact, not a lot has changed since we last visited the palace in late 2016. The series picks up only a few weeks later, and it feels like it’s never been away. The cast and crew slip so effortlessly back into place, this could easily just be Series 1 Episode 9. Admittedly, that might present a teeny-tiny niggle for first-time viewers. While characters are gradually and carefully reintroduced, in general you’re thrown in at the deep end and have to piece it together yourself. But for everyone else, that’s no issue at all. Victoria doesn’t waste time by dragging its opening out, rather it gets straight down to business – and all the better for it. That’s not to say nothing has changed since Series 1. 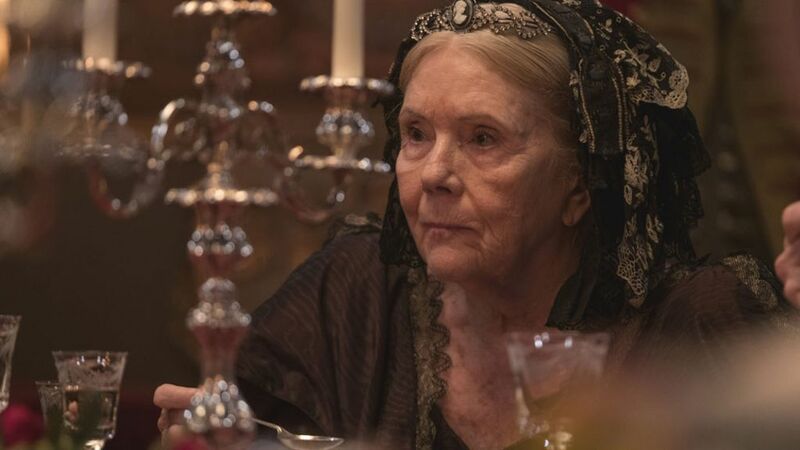 Eve Myles is noticeably absent (Mrs Jenkins has left the palace), but in return we’re introduced to Dame Diana Rigg’s Duchess of Buccleuch. This new “Mistress of the Robe” is a strict, ice-tongued, and socially backward old woman – and she’s great. Full of damning quips and one-liners, she’s easily shaping us as one of the best things about the new series so far. We also see the (eventual) return of Mr Francatelli after his departure at the end of Series 1. Comparing his show-stopping cakes to the new chef’s chicken-head soup, you can see why Victoria would want him back. What this will mean for his and Mrs Skerett will-they-won’t-they relationship remains to be seen. In terms of the primary story, there’s an awful lot going on for Victoria to deal with. She’s torn between her three roles: wife, mother, and queen. To make matters worse, Albert starts withholding information about the British army in Afghanistan from her – causing sparks (and hairbrushes) to fly. The chemistry between Coleman and Hughes is as strong as ever, but the honeymoon phase is over. Victoria and Albert are at loggerheads, while the soldiers face a terrible, near-total defeat in the snowy wasteland. The flashes of their frozen bodies are hauntingly horrific – and only one man lives to tell the tale. Albert and Peel see this as a “humiliation”, but Victoria decides otherwise. She instead brings the nation together in this time of mourning by giving a rousing speech at the Trafalgar celebration. As the show’s theme swells, Victoria reclaims “victory from the jaws of defeat”. It’s telling that the Trafalgar celebration is just one of two big-scale moments in the episode. All the bunting, all those extras… it’s exquisitely extravagant. The other ‘big’ scene is Princess Vicky’s Christening. Set in the church and spectacularly shot, it echoes Victoria’s own coronation and wedding from Series 1. The direction in Victoria is simply second to none, but the show continues to boast great writing and performance too. This first episode is intelligent, involved, and immeasurably funny (don’t get us started on those “helmet” jokes!). By the end, Victoria and Albert are back on good terms and spend a night between the sheets. But with the promise of more babies – and Lord Melbourne! – in the weeks to come, we’re certain the drama isn’t over for them yet. Victoria confidently reclaims its Sunday night crown and we’re thrilled to have it back. It’s so very good to see you again, Your Majesty! 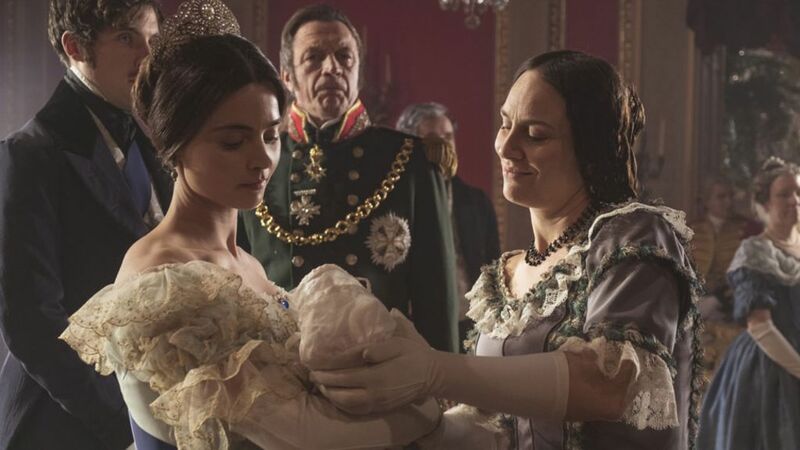 Victoria Series 2 continues next Sunday, 3rd September on ITV.